Make a cute gift bag with the Butterfly Gala stamp set and Butterfly Duet Punch. You can buy these two items as a bundle and Save 10%. This cute bag was very easy and quick to make and uses two free Sale-a-bration items which are FREE with a $60 order. 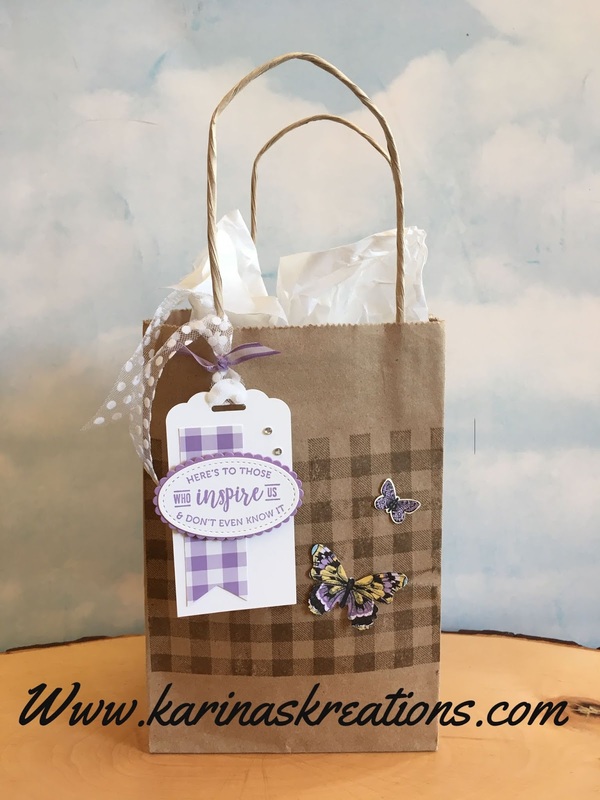 I stamped the bag with the Buffalo Check stamp set and Crumb Cake ink. Two butterflies were punched out of the FREE Botanical Butterfly Designer Series Paper and added to the bag. The tag was made with the Scalloped Tag Topper Punch and Gingham Gala Designer Series Paper. The sentiment was stamped with Highland Heather ink on Whisper White card stock and cut out with the Stitched Shape framelit Dies and layered on a Highland Heather scallop cut out with the Oval Layering Framelits. Here's a supply list for my bag. Please click on a picture below to place an online order.